Payment of $27/month with no interest for 60 months requires a down payment equal to sales tax and delivery (if applicable). For $0 down payment, a total of $1,717.19 will be financed with equal payments of $29/month with no interest for 60 months. Estimated based on initial lease payment of $46.91 plus 60 weekly lease payments, not including sales tax or any optional delivery, warranty, or liability damage waiver (LDW) fees. Unless you exercise your early purchase option, your total cost of ownership will be $2,814.60, not including tax or any optional delivery, warranty, or LDW fees. 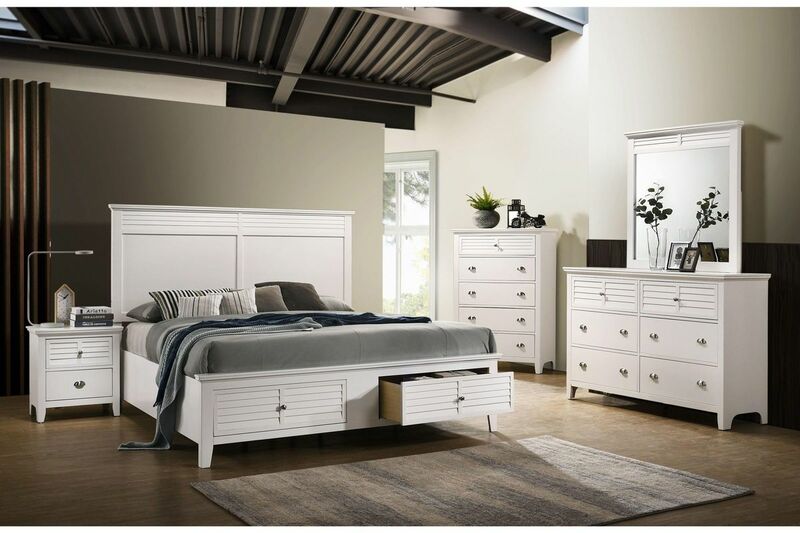 The Harbor 5 Piece bedroom group has a casual contemporary style with a beautiful white finish. Louvered panel details and a combination of brushed nickel knobs and pulls add interesting design details. Constructed with solid tropical wood construction with veneers. Each piece is made from Mortise & Tenon joints and has kenlin metal glide systems. Drawers have ample storage space and the mirror has beveled edge.